LAKEWOOD, Colo., Aug. 2, 2017 /PRNewswire/ -- It's been 62 years since the humble beginnings of Natural Grocers. 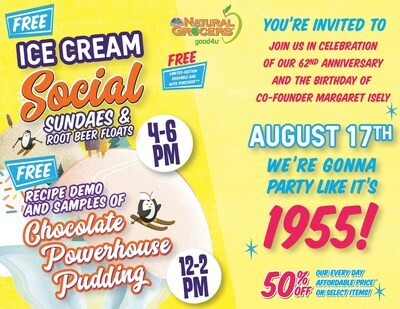 The company plans to celebrate its anniversary in a big way with ice-cream socials, hourly prize giveaways, and 50% off deals at all 140 stores in 19 states on Thursday, August 17. Customers can visit any Natural Grocers store location to take part in the festivities. "Our anniversary celebration is an exciting time because it also commemorates our founder, my mother Margaret Isely, who persevered to build a company that truly supports the community," said Heather Isely, Natural Grocers' Executive Vice President. "We started celebrating two years ago for our 60th anniversary and quickly realized that this event will become a part of our culture for years to come." Dairy-Free Chocolate Powerhouse Pudding recipe demonstration and sampling from noon to 2 p.m.
Natural Grocers by Vitamin Cottage, Inc. (NYSE: NGVC; NaturalGrocers.com) is a rapidly expanding specialty retailer of organic and natural groceries, body care and dietary supplements. The company offers a flexible, neighborhood-store format, affordable prices and free, science-based nutrition education programs to help customers make informed health and nutrition choices. Founded in Colorado in 1955, Natural Grocers has more than 3,000 employees and operates 140 stores in 19 states.